Those who have seen the season of autumn know what is meant by spring. Those who have faced the drought for long only know that what the value of rainfall is. Those who are residing in a polluted atmosphere since long know the value of fragrance on reaching in a fragranced atmosphere. It means that who has been separated from his Satguru knows on meeting with his Satguru that what reconciliation means? 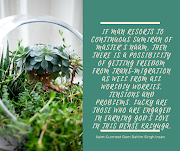 These are the words by respected Hazur Pita Saint Gurmeet Ram Rahim Singh Ji Insan. 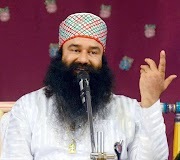 Respected Baba Ram Rahim Ji says that those who had been suffering from grievances-pains since long, know the value of relief, after healing. Those who have received rivers without asking, sometimes become thankless, because they have never ever faced the drought, never seen autumn. May God not let anyone face autumn, and shower everyone with his grace-kindness? No one may remain deprived of his supreme kindness and love. What I mean to say is that if you have been receiving comforts from the Lord since childhood and looting his kindness –grace so far then you should never ride upon the horse of pride, because since you have passed your time under the shadow of kindness –grace of the Lord and you do not know how drought tears the surface of dry earth during drought. How heat oozes out from them. Those who live in the watered zone can never imagine the plight of those facing severe drought. No drought may befall therefore on the soul and it may get the water of Master’s love- affection incessantly. This merciless mind can never be relied on as it may change spring into autumn and whole life may be enmeshed in problems and grievances. Today none is satisfied with his life, except those who are receiving the grace of Allah, Waheguru, and Ram. Otherwise, everybody is worried to be it recluse or householder. You are comfortable if you have control over your mind being a householder or a recluse. If your mind is not under control then you need not to worry on this account, If you are having Gurumantra then it is so powerful as a Sudershan Chakra that will cut your mind to pieces. But one has to raise one’s finger for moving Sudershan Chakra, while Sudershan Chakra of Naam is used by the tongue. Now the question arises whether you move your tongue for running of Sudershan of Ram Naam? 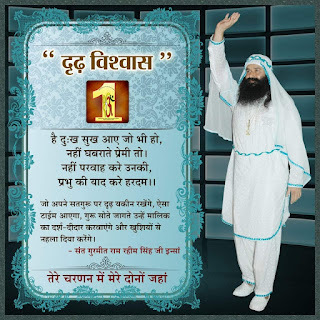 This the fact that if you do meditation of God’s words for an hour both in the morning-evening and earn your living through hard work and honest means, then no worry will enter your peaceful life. His Holiness Baba Gurmeet Ram Rahim Singh Insan says that they should be in the company of only those, who remind them about their Master. Move in the company of those whose eyes glow with the memory of Allah, Waheguru, Ram only and none else, whose ears reverberate with none else. If you move in the company of such blessed souls, then your soul will also become blessed. If you will move in the society of such persons who do not admit the authority of Allah, Waheguru, Ram; backbiting-defaming is whose profession, is always busy in evil deeds then how I will be able to bless you with the blessing of forever blessed? How I will plead that the permanent bliss is inherited by you in the love-affection of the Master? How you will admit that that Lord grants life in dead bodies and makes them stand up because by then your mind-brain turns to be infertile. Asks true Master. 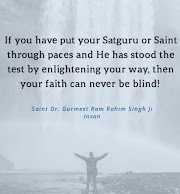 Baba Ram Rahim Ji says that put the seed of Ram Naam (God’s words) in that infertile land, drench it with Sat sang’s water, hear and act, then the flower-buds of his kindness-grace will appear there even and you will become prosperous overnight.